I won't be posting again until the first week in January. My family is heading to the desert the day after Christmas to camp and ride dirt bikes for a week. No Cell phone coverage and no internet. As a long-time junior high small group leader I have often felt frustrated by the very thing that frustrates most of my volunteers: Tangents! Oh, tangents....those wonderful diversions that we have tried to, but will never, get rid of. Here's my simple thought on tangents: Go with 'em. Seriously, my thinking is that any spiritual conversation among junior highers is good conversation. So, if in the middle of your enlightening study of Exodus, a 7th grader suddenly asks why bad things happen to good people....go with it. If your 8th grade girls are in the mood to talk about dating....go with it. Tangents that have no spiritual value may need to be cut short and allowed to be explored at a later time, but tangents that are simply taking you down a different spiritual road than the one you planned can lead to some great discussion. I really don't know what to say about this. It looks like my world is about to change quite a bit. I have just received word that I have been named Time Magazine's PERSON OF THE YEAR! I want to accept the award on behalf of all the other people who work with junior high students. May the recognition I am receiving be a small piece of recognition for you as well. 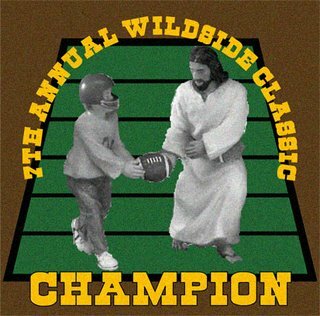 Each year we have a huge event called the Wildside Bowl. Flag football teams are formed by matching a boys small group with a girls small group. We have seperate 7th and 8th grade brackets and each grade crowns a champion by the end of the day. We I say a huge event, I mean a HUGE event. When you add up the kids playing, the volunteers coaching and the families cheering, it is easily our biggest event of the year. The 7th and 8th grade champs get their names added to the trophy and they also get a Wildside Bowl Champs T-shirt. To the right, you will see one shirt design that I had to turn down. Funny, creative, cool, cheesy....but would have set in motion dozen and dozens of phone calls from parents. Wow! Today went buy really fast. What I had hoped would be a 'catch up' day turned into a day of doing a bunch of other stuff....mostly good. - Had a spontaneous staff Christmas breakfast. Ate good food and had fun hanging out. - Went and visited one of our key volunteers at his new store, The Wine Pavillion. I'm not a drinker, so I had fun asking a bunch of totally stupid wine questions. He also had his cheese expert give me some samples and a little cheese history lesson which was quite interesting actually. - Went to a two hour planning meeting for our first-ever 'family weekend' that is happening on new year's weekend. Trying to build a weekend service that appeals to everybody from 1st grade - Senior adults was more challenging than we had imagined. - Rushed to a local park to take family Christmas pictures. Yes, we somehow think we'll get the pictures back and mailed out before Christmas. Perhaps the best weekend in a long time....but lowest attendance. It was one of those weekends when everything seemed to work well and fit together nicely. Music was fun, the games were good, we stole a super funny video from the high school department that was a hit. All in all it was fantastic. One bitter-sweet part of the weekend was that it was John Snyder's last official weekend as an intern. John has spent the past two years with us and has been a GREAT ministry partner and friend. His life is taking some exciting turns as he wraps up his internship. In January, he'll start his first full time ministry role as a junior high associate at a great church in his home state of Oklahoma and then in May he's marrying Mariah, one of our junior high coordinators. While the ministry partnership with John is coming to a close, I'm glad that the friendship side won't. You probably don't have everything you want, but this simple little exercise will certainly open your eyes to the fact that you have WAY more than most. I gotta be honest, it rocked my world a little bit. Not too long ago, I suddenly realized that it had been quite a while since I shared the gospel , or had any real spiritual conversation, with a non-believer outside the walls of my church. Now, the people in my neighborhood all know I'm a Pastor and we've had lots of talks at different times, but I was suddenly uncomfortable with how comfortable I have become. Tuesday, I had to hang out at the house for a couple hours because Rachel was running errands and we had an appointment with the washing machine repair man. As I was doing some writing in the living room, I heard a knock at the door. I was expecting the washing machine repair man and this would probably be a better story if it was, indeed, him and I led him to Christ while he fixed my washing machine. But no...It was a super friendly and charismatic Jehovah’s Witness wanting to know my thoughts on "why Christianity was failing...". I suddenly decided this was a good time to brush up on what I like to call 'Apologetics wrapped in love'. Without thinking, I invited him into my home, poured him a glass of ice water and engaged in a 90 minute discussion of faith, Christianity, Saddleback church, Rick Warren and, of course....The deity of Jesus Christ and the concept of the trinity. We challenged each other, we argued and we laughed. We laughed a LOT! I am not a converted Jehovah’s Witness and my new friend is not a converted Christ follower (although he does call himself a Christian). But it was a fantastic reminder that I am a believer in Jesus first and a Pastor second. As such, I'm expected to be salt and light in a lost world...not just within the walls of my church and at youth ministry training events. I've made no adjustments. Well, I guess the only tweak I've made is that I tell fewer stories about my daughter, but other than that I have purposely made no adjustments. Let me explain. The way I see it, Kayla didn't chose to be born into the family of a Pastor let alone her own youth pastor! My wife and I decided early on that we would never expect more from our kids just because they were PK's. I'm raising my kids as a man who is a Christ-follower not as a man who is a Pastor. Personally, as a Christ-follower, I would have no problem if Kayla wanted to dye her hair hot pink. So, as a Pastor, I have no problem with it either. As a Christ-follower, I'm paying close attention to the choices she is making. I'm doing the same thing as a Pastor. So maybe that's actually a big adjustment. I tend to think it feels more like no adjustment. I'm hoping and praying that I can be a really good dad to my daughter and that I can be a good youth pastor to her too. BIRTHDAYS: Today is Rachel's 34th B-day so I surprised her with a half-day at the spa. I'm going to pick her up around 1:00 and then we'll head off to a fancy lunch...probably something like Burger King or Quizno's. BRIDES: Mariah Miles, who oversees our entire small group ministry, recently became engaged to John, one of our interns. His internship is up in a couple of weeks and he has accepted a junior high position at a church in his home state of Oklahoma. I'm super excited for them, but bracing up for a big transition on our team as I set out to find a female associate. BILLIARDS: Just turned down a really nice pool table that a family in our church wanted to donate to our ministry or our family. Unfortunately there is no room in our junior high tent or our house. I'm sad because I really hate to turn down free stuff! BLOGS: Lately I've been spending way too much time visiting certain blogs that are highly critical of Saddleback and other large, high profile ministries. I don't even know why I bother because they are written by people who are un-informed and petty. Today, I felt a real sensing of the Spirit that I need to quit rewarding them by visiting their sites. This weekend felt like a roller coaster. Some parts of it were really fun and worked well and other parts missed the mark. Most of what missed the mark was stuff I was responsible for! We played a game around the game 'perfection' to set up the lesson (my idea...) that was so boring we had to cut it after Saturday night. The lesson (my lesson...) was way too long and complicated on Saturday night so I tried to re-tool and shorten it for Sunday which made it better, but not real strong. I'm sad about that because I really did put a lot of time into it, but I tried to compare perfection in the world's eyes vs. perfection in God's eyes and how an imperfect world really puts a ton of pressure on us while a perfect God who deserves perfection has provided a way out.......even typing this I can't figure out quite why it didn't work as well as it could have. Our music seemed to really struggle. It was mainly due to a good thing: A few first time players. But, we were saved by a fun Santa and Elf appearance to run a game as well as the knowledge that my lesson was a gospel presentation that several students responded to and asked some follow up questions about. This silly little game was posted on the SJH message boards. My record: 320.9 after about 25 tries. I'm having a meeting today to try to get a better handle on our ministry to teenagers with special needs. Currently we offer a separate program, but we haven't really put our heart or resources into it and it's beginning to catch up with us. We've got a good team of volunteers who really do feel called to ministering to these students, but we have lousy facilities, a poor budget and have had a hard time getting the momentum we need to turn the corner and make this a significant ministry. I'm praying that this meeting will really mark a turning point for us. I had seen the season 6 trailer but not this extended, 10 minute, preview. Warning: This may reveal more than some of you want to know. p.s. I don't like the cheesy Ford product placement....talk about an out-of-place vehicle! 4. Post the text of the next four sentences on your blog, along with these instructions. 5. Don’t you dare dig for that “cool” or “intellectual” book in your closet! I know you were thinking about it! Just pick up whatever is closest! As soon as I read this I spun around in my chair to see what book was the closest to me. 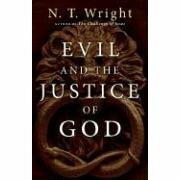 It was obvious: A complimentary copy of Evil And the Justice Of God by N.T. Wright was mailed to me this morning and it was sitting on my table. I haven't even cracked it open yet, so reading the 5th sentence of page 123 will be my first of the book. "Again and again one hears it said or implied that some people are simply "evil" and must therefore be locked up for a long time. Over against this, an older generation of liberal thinkers, alarmed at the thought that there might actually be such a thing as "evil"--which they thought had been banished by act of Congress and better drains--tried to insist that nobody was evil at all, merely misguided, and that the misguiding had been done by society as a whole, so that all of us were equally guilty. The political pendulum has swung between these two extremes: the one side seeking to lock up more and more of the population without realizing that they were thereby creating universities of crime; and the other side trying to look the other way and pretend, with a fine suburban detachment, that everything is really all right after all." Okay, I sort of bent rule #4 and only included the next two sentences because A) this author loves really long sentences and b) because it was the end of the paragraph. This isn't typically a book I would read cover to cover, and probably still won't. But It does look like one worth keeping. It may hold some good insight into the classic JH question of why God allows bad things to happen to good people. - Our junio high team Christmas Breakfast. We pulled names for Secret Santa and, in addition to buying a gift, had to write a poem about our recipient. - We have a lot of volunteers who seem to be going through some rough times right now...a couple need immediate attention today. - My son and I are frantically working to finish his 4th grade California Mission report which includes building a model of the actual mission. Really fun, but TONS of work. It's due Friday and we are way behind. - Lots of catching up to do since I've had a wild Y.S. season that has put some other important stuff on hold. We had a really good lesson this weekend. Allison taught, and it's always great to have a female voice in front of our students. I don't think we did anything amazing this weekend but it flowed well, was really fun and students responded well. The interaction with students and the simple games we played made it feel more like a youth group than a youth ministry, and that was nice. "What about your youth ministry is an embarrassment to Jesus?" - Can God ever really be embarrassed by his Children? Does his total love for us make it impossible to be embarrassed by us? I don't know. - If we can embarrass him, is he more embarrassed by junk in my heart or visible junk that mis-represents him to others? Maybe both? - Certainly a poorly delivered message or a half-hearted video doesn't embarrass him, does it? I'm sure that if God is capable of being embarrassed by me or my ministry, then I've given him plenty to be embarrassed about.